Mr. Angel Gurría, Secretary-General of the OECD, was in Stockholm from 28 to 30 August 2016 to attend the World Water Week. The Secretary-General delivered a keynote speech at the plenary high-level panel on Water for Sustainable Growth and participated in the OECD seminar Water as a Driver for Sustainable Growth and the OECD seminar on Water Finance. In Stockholm, Mr. Gurría also held bilateral meetings with Mr. Stefan Löfven, Prime Minister of Sweden, several ministers and high-level officials, and Ms. Karin Wanngård, Mayor of Stockholm. 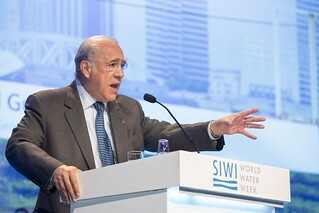 29 August 2016 - Secretary-General Gurría speaking at the opening plenary of the World Water Week. Stockholm, Sweden.